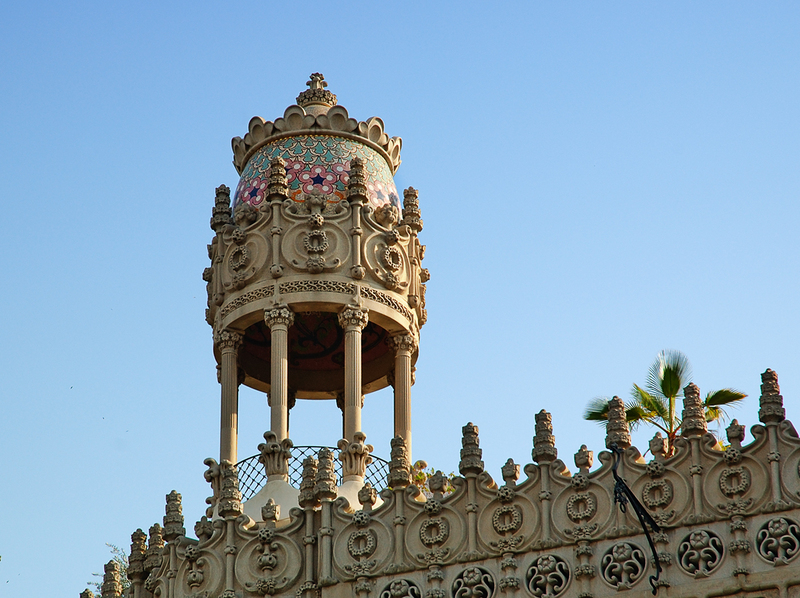 This is a detail of the small turret on top of Casa Lleó i Morera at Passeig de Gràcia 35. The modernist house by Lluís Domènech i Montaner is part of the renown Illa de la Discordia (Block of Discord) called this way due to the clash of different styles between three famous houses in the block. The other two are Casa Amatller at Passeig de Gràcia 41 designed by Josep Puig i Cadafalch and Casa Batlló at Passeig de Gràcia 43 designed by Antoni Gaudí. The building is located on the corner of Consell de Cent and Passeig de Gracia and was originally constructed in 1864 and renovated in 1902. When you come to Barcelona it would be almost a crime not to visit this Manzana de la Discordia. For those that are less interested in art and more in going shopping, there's a Loewe shop in the ground floor. I saw this when we were in Barcelona, and I thought it beautiful then and still think so. Nice photo.